Why our hand sanitizer is superior to others on the market! Prefense is made of all-natural organic ingredients and has absolutely NO alcohol in it! · Our technology protects you for 24 hours or 10 hand washings! This is what moms really love to hear about! · Prefense is non-toxic and safe for kids! It will not hurt you if swallowed! · Prefense is silica based which means it doesn’t dry out your hands like traditional alcohol sanitizers. It actually smoothes and softens your hands. You can totally see this when you apply it! · Prefense protects against staph, strep, E.coli, drug resistant MRSA strains, and more. We fight germs that other hand sanitizers can’t. Review~ I received a sample size bottle that fits easily in my purse. I like that its not sticky and doesnt have a bad smell like other hand sanitizers. It comes out in a foam and rubs on easily. It leaves my hands soft as well as clean. The best part is that its alcohol free and wont taste it on your hands if you sanitize before you eat! I give this product a 5 out of 5! You can purchase a 1.5oz or an 8oz bottle of Prefense by searching for a local seller here. Prefense is also available on amazon. It cost $9 on amazon for 2 1.5oz bottles. Giveaway~Prefense is offering a big 8oz bottle of Prefense which offers 640 applications to one of my readers! Giveaway open to US residents only. Tell me what you like about Prefense and why you would like to win the 8oz bottle! Please include your contact email in your entry comments so that i can contact you if you win. 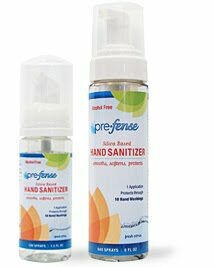 for an extra entry please comment on thier wall "New fan, sent by Dnbuster"
for an extrea entry please tweet this "I entered to Win 8oz @prefense Foaming Hand Sanitizer- lasts 24 HRS!! @Dnbuster http://tinyurl.com/3kjwhon - ends 5/1"
Giveaway will end 5/1 @11:59PM CST. Winner will be choosen by random.org and has 48 hours to respond to emailor another winner will be choosen. Prize will be shipped from the sponser so please allow up to 2 weeks to receive. I like that it doesn't contain alcohol so it won't dry out my hands! It sounds like it would be easy to take with you places, which is important for me since I'm on the go a lot-- and I work at a garden shop & spend free time in barns, so I need something to get my hands clean! The fact that it also smooths and softens hands is fantastic! Oh, I love that it is alcohol free, which means it won't dry out my hands. 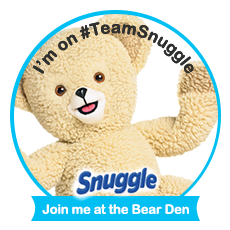 I would like to win one, because I do use quite a bit of hand sanitizer. I seem to always be on the go and use sanitizer to keep the germs of my hands. I am following Prefense on Twitter. I like how it has no alcohol. I have eczema on one hand and alcohol-based sanitizers really cause flare-ups! Sounds family-friendly, too. I would like to win it so I could use it in my car. I drive a lot every day. It is always helpful. Thank for posting your giveaway. It is now live on our website! I like that Prefense is made of all-natural organic ingredients! I "like" Prefense on facebook. I follow Prefense on Twitter. I like the way it dispenses and the shape of the bottle. We use a lot of hand sanitizer is why I would like to win. I like how it wont dry out my hands! I like that it is alcohol free! I'd like this to get rid of the horrible sanitizer smell. I LOVE that it lasts 24 Hours!! I love that Prefense has NO alcohol so it's probably not as drying as regular sanitizer.